My mother does just about everything right. She has unparalleled listening skills, she's great with people and she has a heart of gold. As part of her job in the child care industry, my mom makes dealing with kids appear easy. Even trickier, she handles their parents with style and grace. At home, she easily pulls off even the most complex holiday dinners. The list goes on. I would not be surprised if my mother can actually leap tall buildings in a single bound, but that she is simply too humble to have mentioned it. For all of her accomplishments, one of the things that my mom does best is watch movies on Lifetime TV, the cable network for women. Lifetime's movies focus mainly on diseases, child abduction and spousal abuse. Also, they throw in some sweeping romantic dramas for good measure. Originally, jobs in Lifetime movies were reserved for the likes of big stars such as Victoria Principal, Valerie Bertinelli and Richard Chamberlain, who is the "King of the TV Mini-Series." But nowthanks to the power of the InternetI, too, can "star" in them, and make my mom proud this Mother's Day season. For the "thrill of a Lifetime," simply roll your mouse pointer over the links to the right while keeping an eye on the picture of me. Happy Mother's Day, mom. Love, Jeff.  With John Travolta, star of the original "Boy In The Plastic Bubble," demanding $20 million to appear in their remake, Lifetime execs resort to "Plan B."  An original "Thorn Birds" promotional photo, before a jealous Richard Chamberlain demanded a "do over."  While Richard Chamberlain must choose between his ambition and his love for a woman, his co-star struggles with an obsession of her own.  Hollywood is buzzing about who will play romance novel cover-boy Fabio in his upcoming Lifetime bio-pic. 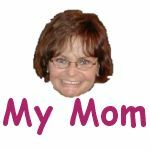 Click here to email the jeffthomas.com Mother's Day greeting to your mom!